That mic stand needs some adjustment, we suspect. 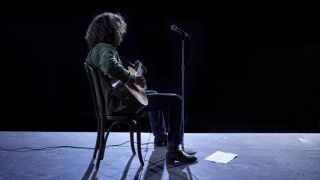 Nothing quite compares to the sense of foreboding when you're at a social gathering and someone picks up an acoustic guitar, but fortunately, professional recording artists have committed some great acoustic performances to tape. From Hank Williams to Ed Sheeran, musicians have never been shy of stripping away the production trimmings and taking a song back to just a guy/girl and a simple acoustic-based arrangement, and the result has been some of the most beautiful music of the past 60 years. But what is the best acoustic song of all time? We've collated our own favourites and your nominations into the list of 50 below, and now we want you to vote for a winner. The results will be presented at the end of November, so get voting!